This title brings forensic scientists and chemists up-to-date on the latest instrumental methods for analysing trace evidence, including mass spectrometry, image analysis, DIOS-MS, ELISA characterization, statistical validation, and others. Illustrates comparative analysis of trace evidence by both old and new methods. Explains why some newer methods are superior to older, established methods. 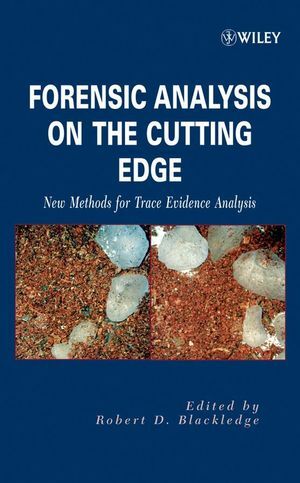 Includes chapters on analysis of DNA, ink, dyes, glitter, gun powder traces, condom trace evidence, footwear impressions, toolmark impressions, surveillance videos, glass particles, and dirt. Discusses applications such as mass spectrometry, image analysis, desorption-ionization on silicon mass spectrometry (DIOS-MS), ELISA characterization, and statistical validation. Robert D. Blackledge, now retired, was the senior forensic chemist at the Naval Criminal Investigative Service Regional Forensic Laboratory in San Diego, California. He has a bachelor's degree in chemistry from the Citadel and a master's degree in chemistry from the University of Georgia. He serves as an Adjunct Professor in the Master of Forensic Sciences Program at National University, San Diego, California. 1. All that Glitters Is Gold! (Robert D. Blackledge and Edwin L. Jones, Jr.). 1.2 The Ideal Contact Trace. 1.2.2 High Probability of Transfer and Retention. 1.2.4 Quickly and Easily Collected, Separated, and Concentrated. 1.3.10 Scanning Electron Microscopy/Energy Dispersive Spectroscopy. 1.4 Glitter as Evidence in Criminal Cases. 2. Forensic Analysis of Automotive Airbag Contact—Not Just a Bag of Hot Air (Glenn D. Schubert). 2.2 How Do Airbags Work? 2.3 Types of Forensic Evidence to Look for. 2.4 Airbag Case Reports and Examples. 2.5 Changes that Are Occurring. 3. Ink Analysis Using UV Laser Desorption Mass Spectrometry (John Allison). 3.3 The Analyte Target Molecules. 3.4 LDMS for the Analysis of Dyes in Pen Inks. 3.6 LDMS Analyses that "Don't Work." 4. Condom Trace Evidence in Sexual Assaults: Recovery and Characterization (Wolfgang Keil). 4.1.2 Production, Sale, and Use of Condoms. 4.2 Examination for Condom Residue Traces. 4.3 Forensic Evaluation of the Substances and Examinations. 5. Latent Invisible Trace Evidence: Chemical Detection Strategies (Gabor Patonay, Brian Eckenrode, James John Krutak, Jozef Salon,and Lucjan Strekowski). 5.3 Fingerprint Detection with Near-Infrared Dyes. 5.4.1 Pepper Spray Detection Using Near-Infrared Fluorescent Dyes. 5.4.2 Pepper Spray Detection Using Chemical Derivatization. 6. Applications of Cathodoluminescence in Forensic Science (Christopher S. Palenik and JoAnn Buscaglia). 6.4 Techniques and Forensic Considerations. 6.4.2 Sample Preparation and Preservation. 6.7 Geological Samples: Soil and Sand. 6.8.2 Slag, Fly Ash, and Bottom Ash. 7. Forensic Application of DARTTM (Direct Analysis in Real Time) Mass Spectrometry (James A. Laramée, Robert B. Cody, J. Michael Nilles, and H. Dupont Durst). 7.3 Drug and Pharmaceutical Analysis. 7.3.3 Drug Residues on Surfaces. 7.4 Samples from the Human Body. 7.10 Elevated-Temperature DART for Material Identifi cation. 7.14 Identifi cation of Inks. 8. Forensic Analysis of Dyes in Fibers Via Mass Spectrometry (Linda A. Lewis and Michael E. Sigman). 8.2 Conventional Fiber Color Comparison Methods Employed in Forensic Laboratories. 8.3 Shortcomings Associated with UV–Vis Based Comparative Analysis for Trace-Fiber Color Evaluations. 8.4 General Overview of Modern Dye Ionization Techniques for Mass Analysis. 8.5 Trace-Fiber Color Discrimination by Direct ESI-MS Analysis. 8.6 Examples of Negative Ion ESI-MS Analysis of Colored Nylon Windings. 8.7 Examples of Tandem Mass Spectrometry (MS/MS) Applications to Elucidate Structure. 8.8 LC-MS Analysis of Dyes Extracted from Trace Fibers. 8.9 Proposed Protocols to Compare Trace-Fiber Extracts. 8.9.1 Direct Infusion MS/MS Protocol. 8.9.2 Generalized LC-MS and LC-MS/MS Protocol. 9. Characterization of Surface-Modifi ed Fibers (Robert D. Blackledge and Kurt Gaenzle). 9.1 Fibers as Associative Evidence. 9.3.1 Infrared Spectra and Properties Measured by Polarized Light Microscopy. 9.3.2 Infrared Mapping with an FTIR Microscope. 9.3.4 AATCC Test Method 118-2002. 9.4.1 Scanning Electron Microscopy/Energy Dispersive Spectroscopy. 9.4.3 Pyrolysis Gas Chromatography/Mass Spectrometry. 10. Characterization of Smokeless Powders (Wayne Moorehead). 10.2.1 Identifi cation of Smokeless Powder. 10.3 Brief History of Smokeless Powder. 10.4 Characterization Toward Smokeless Powder Identification. 10.5 Characterization Toward Brand Identification. 10.9 Chromatography with Mass Spectrometry. 11. Glass Cuts (Helen R. Griffin). 11.3 A Hit and Run. 11.5 Slash Cuts Made by Glass. 12. Forensic Examination of Pressure Sensitive Tape (Jenny M. Smith). 12.6.2 Polarized Light Microscopy Examinations of Packing Tapes. 12.6.3 Is It MOPP or BOPP? 12.6.5 Degree of Offset from the Machine Edge. 12.9.1 Sharing Evidence with Other Sections. 12.9.2 Untangling Tape and Recovering Trace Evidence. 12.10.3 Separation of Backing, Reinforcement, and Adhesive. 12.10.8 Sourcing Tape Products to a Manufacturer. 13. Discrimination of Forensic Analytical Chemical Data Using Multivariate Statistics (Stephen L. Morgan and Edward G. Bartick). 13.2 Experimental Design and Preprocessing. 13.3 Dimensionality Reduction by Principal Component Analysis for Visualizing Multivariate Data. 13.4 Visualizing Group Differences by Linear Discriminant Analysis. 13.5 Group Separation, Classifi cation Accuracy, and Outlier Detection. 14. The Color Determination of Optically Variable Flake Pigments (Michael R. Nofi). 14.2 OVP: Form, Characteristics, and Function. 14.6 Methods of Formulating OVP. 14.10 Switching Objective Magnifi cations. 14.13 Sample Preparation and Measurement. 14.15 Statistical Methods of Evaluation. 14.16 Challenges for the Future. 15. Forensic Science Applications of Stable Isotope Ratio Analysis (James R. Ehleringer, Thure E. Cerling, and Jason B. West). 15.1 What Are Stable Isotopes? 15.2 What Are the Units for Expressing the Abundance of Stable Isotopes? 15.3 What Is the Basis for Variations in Stable Isotope Abundances? 15.4 What Instrumentation Is Needed for High-Precision Stable Isotope Measurements? 15.5 How Can Stable Isotope Analyses Assist Forensics Cases? 15.6 Stable Isotope Abundances in Forensic Evidence. 15.6.1 Food Products, Food Authenticity, and Adulteration. 15.6.2 Doping and Drugs of Abuse. 15.6.3 Sourcing of Humans, Animals, and Animal Products. 15.6.4 Humans: Bones, Hair, and Teeth. 15.6.5 Stable Isotope Abundances of Manufactured Items.